A new breast MRI protocol may improve cancer detection in women with dense breasts. The protocol, abbreviated breast MR (AB-MR), significantly reduces the amount of time needed for a breast MR exam without sacrificing diagnostic quality. Wider use of this protocol has the potential to significantly expand the use of breast MRI. Although MRI finds more early breast cancers than mammograms, it's currently used only as an adjunct imaging test. "We know breast MRI is, by far, our most sensitive method of detecting early breast cancers, so it's fair to ask why we haven't used it more," says Craig Hanson, MD, president and CEO of Via Radiology and medical director of Seattle Breast Center at the University of Washington Medicine/Northwest Hospital & Medical Center. Hanson says there are a few reasons that MRI is not used as a primary screening test. One is that there haven't been many studies on the efficacy of breast MRI for women at normal risk of breast cancer. The two biggest reasons, though, are a lack of MRI capacity nationwide and MRI's much higher cost compared with mammograms or breast ultrasound. 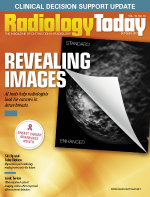 Because of its high cost, payers generally only reimburse for breast MRI in high-risk cases. It's no secret that finding cancers in dense breast tissue is more challenging than finding them in nondense tissue, and women with dense breasts have higher cancer rates. To date, 31 states have passed notification laws to alert women to the higher risk and encourage screening. With nearly one-half of women having dense breasts, however, screening all of them with standard MRI is not considered a viable option. Between 2005 and 2013, Christiane Kühl, MD, director of the diagnostic and interventional radiology clinic at RWTH Aachen University Hospital, and colleagues conducted a supplemental breast MRI study of 2,000 average-risk women. They reported that breast MRI had an incremental cancer detection rate—the rate of detection in excess of what mammography would find—of 15.5 per 1,000 women screened. In addition, the detected cancers were early stage; 93.4% were node negative; the false-positive rate was 2.9%; nearly 50% of the cancers were high-grade, aggressive lesions; and the interval cancer rate—cancers discovered at one-, two-, and three-year follow ups—was 0%. "And that is just amazing," Hanson says. "Interval cancers tend to be more aggressive, harder-to-treat cancers, and when you look at the cost-effectiveness of a modality, you have to take into account what the cost of treating an early stage vs later stage breast cancer is." Because a standard dynamic contrast-enhanced (DCE) MRI can take 20 to 25 minutes, Kühl and colleagues conducted another study using an AB-MR protocol. The protocol omitted the kinetic analysis portions of the exam that look at how fast contrast is taken up by a lesion and how fast it leaves. In doing so, they were able to reduce the image acquisition time to three minutes, with a diagnostic accuracy equivalent to a standard DCE protocol. The average interpretation time for the AB-MR exam was less than the time required for a digital breast tomosynthesis exam. "With current MRI technology, we don't necessarily need kinetics, we just need to rely primarily on morphology of the lesion," Hanson says. Kühl's results and those of other researchers convinced Hanson to adopt an AB-MR protocol at Via Radiology. The exam is performed at Via's freestanding outpatient imaging center, which is accredited for standard breast MRI. The exam is performed on a 1.5 T wide-bore scanner with an eight-channel breast coil and uses three pulses instead of seven. "In our hands, we've got it down to about seven minutes of acquisition time," Hanson says. "[Kühl] doesn't do fat suppression, whereas most facilities in the United States do, and that takes a little more time. She relies primarliy on the subtraction views, which, if the patient moves a little bit, can be problematic. But she does extremely well without fat suppression." Most women who get AB-MR at Via are not considered high risk; payers will pay for women at high risk to have a standard MRI. After some research, Via's AB-MR was priced at $495, which includes the professional and technical components of the fee. Hanson says women pay out of pocket, which can be a significant expense for some, but Via does offer installment payments. "The other important thing about the interval cancer rate is—because Dr. Kühl didn't find any interval cancers at one-, two-, or three-year intervals—we may not need to screen these women as frequently as we do with mammograms," Hanson says. "We may be able to do it every two years or, for postmenopausal women, maybe every three years. The appropriate interval needs to be determined, and that may spread out the cost." Only a few imaging centers in the United States offer AB-MR, and Via performs around two per day, about 90 to date. Hanson says Via tracks women who receive AB-MR just as they do women who get mammograms, which will help them to determine their false-positive rate over time. A big remaining question is whether—with the reduced cost, potential for increased throughput, and longer screening intervals—AB-MR is a cost-effective exam. "It would be interesting to find out. A study hasn't been done to look at the cost-effectiveness of this," Hanson says. "And cost-effective for whom? That's always the question: What's a human life worth? But there are models that look at that sort of thing." Although Hanson believes AB-MR should be used much more widely, he says it takes time to educate patients and referring providers about its benefits. Accordingly, states that have had breast density notification laws on their books for a longer time are farther ahead in the game, in terms of informing women with dense breasts about their options; Washington, where Hanson practices, does not yet have a notification law. He adds that dedicated breast MRI machines that are easy for technologists to use and comfortable for patients would also help. The most helpful change, however, would be for states to mandate that payers reimburse for supplemental breast screenings. "The big problem, and frankly it's the same problem with ultrasound, is that the commercial payers and Medicare won't pay for supplemental ultrasound or MRI unless you're at high risk, except for a few states that have mandated such coverage, such as the state of New York," Hanson says. "That's the elephant in the room, really. We have this superior technology; in fact, many experts believe that it can replace mammograms in dense-breasted women. That's a many years away project, but you need a paradigm shift for that to occur, and there are a lot of practical hurdles to get over."